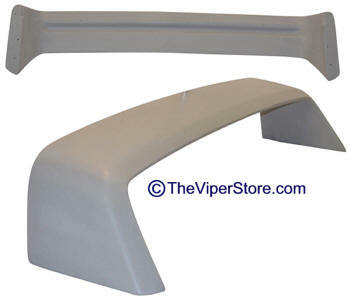 This is a fiberglass spoiler (hollow) lightweight. Same size and shape as factory spoiler for a lot less money. Includes all mounting hardware. 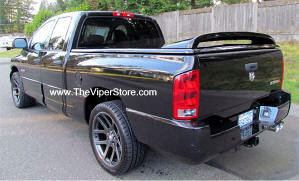 New Aftermarket, Dodge Truck SRT10 Edition Rear Spoiler For 2002-2010 Rams. 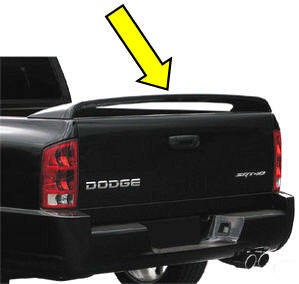 Although this spoiler was manufactured for the Dodge Rams, it also fits many other makes and models including many with hard bed covers. The spoiler is fiberglass construction & it's not uncommon cutting to make it less wide for correct fitment on a bed cover. 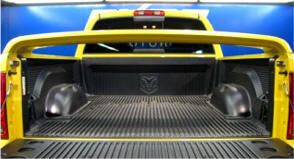 Customers do it all the time, see spoiler dimensions below. 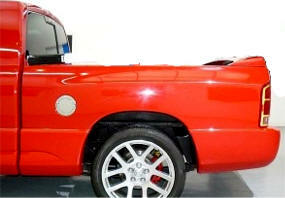 FRONT BOLT-BOLT - 64 3/4"
REAR OVERALL LENGTH OF SPOILER IS 68 INCHES. 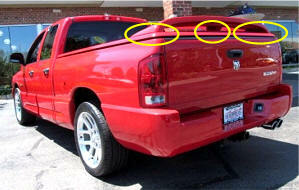 THE SPOILER TAPERS WIDER TOWARDS THE CAB, JUST LIKE THE DODGE RAM BED RAILS DO. 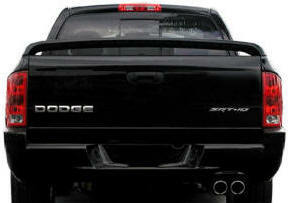 Get the ultra aggressive look of the all-new Dodge Ram SRT10 edition! Fits all 2002-2007 Rams. Available in any color as well as OEM matte black. Bolt easily to the Bed Rails using household tools. This is a fiberglass spoiler (hollow) lightweight. Same shape as factory spoiler for a lot less money. 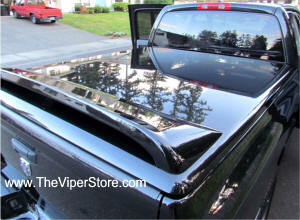 This spoiler has been shortened so that it will fit almost any aftermarket tonneau cover like the one you already have! 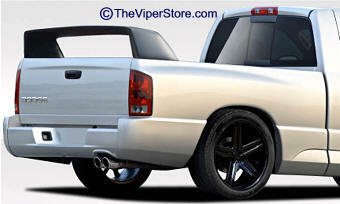 This Daytona Style RAM wing is designed to bolt onto your truck bed edge. Comes bolts and unpainted. 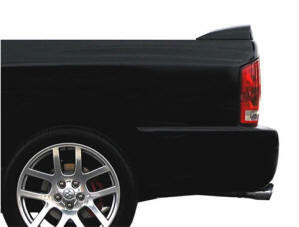 *Also available - Special order: Dayton Wing to fit on top your tonneau cover - call for details. 2 x screws plus 2 x bolts 4pc set. Needed for installation of factory spoiler. Note: Rear mounting studs are no longer available. Rear Studs (shown above) are NOT included and no longer available. If you have at least on of these studs we can make them for you if you send it to us. 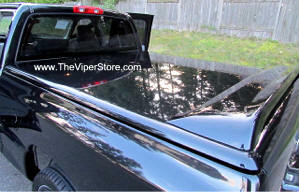 Need a Tonneau Cover for your bed? Click here.